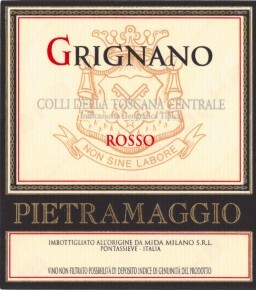 Grignano ‘Pietramaggio’ Rosso is an excellent value IGT Toscana wine made with 75% Sangiovese grapes and a variety of other, local red grapes. A delicious, easy-going wine, loaded with dark cherries mixed with tobacco and spice. Supple and sweet, with fresh acidity enlivening the juicy dark berry and mint flavors. Finishes moderately long, with supple tannins. Ideal with traditional Tuscan cuisine, pasta dishes, grilled meats, and cheeses. A great value wine which is excellent with food. Harvest takes place between the second half of September and the first half of October. Fermentation in stainless steel tanks at controlled temperatures. Malolactic is carried out in fiberglass-lined cement vats. 6 months in 18 hl French oak barrels plus a minimum of 6 months in bottle prior to release.